© The Monday Campaigns, Inc. 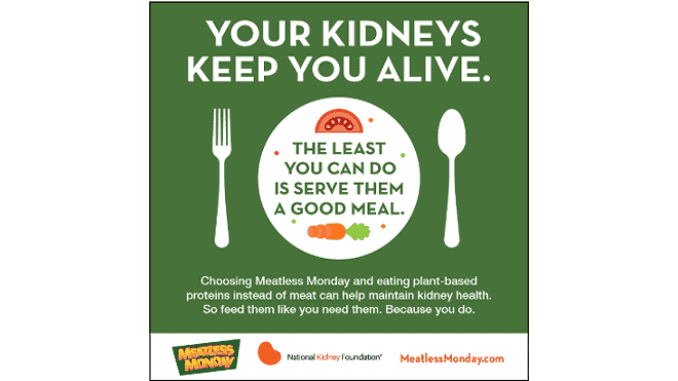 The US-based National Kidney Foundation (NKF) has recently formed a new partnership with the global health initiative The Monday Campaigns, which includes Meatless Mondays, to encourage Americans to make their diet healthier. Studies have shown that eating meatless foods and maintaining a balanced diet can slow the progression of kidney disease. With a catchy advertising campaign and research showing the link between good general health and the vital role of the kidneys, the new campaign encourages all Americans to enjoy more meatless foods to support kidney function. With slogans like “Your kidneys keep you alive. The least you can do is give them a good meal,” followed by important information on how eating plant-based proteins instead of meat can help maintain kidney health, the campaign draws attention to the health benefits of a plant-based diet. The links between kidney disease, high blood pressure, heart disease and diabetes are often overlooked. However, diabetes and hypertension are the main risk factors for the development of kidney disease, accounting for two-thirds of all cases. Kidney disease can also lead to high blood pressure and heart disease, which is the most common cause of death in kidney disease patients.